From a hip taco truck to award-winning mixologists shaking up custom craft cocktails, check out these out-of-the-box Chicago catering experiences. Are you looking for unique Chicago catering ideas for your next event? Whether you want to bring the party to your group (think a mixologist whipping up artisan cocktails or a trendy taco food truck) or are looking for a venue with out-of-the-box catering services, you’ll find plenty of options. We’ve got five Chicago catering experiences to get you started. The Violet Hour is a Wicker Park salon credited with kicking off the craft cocktail craze in Chicago, and is known for an impressive bar program of pre-Prohibition-style cocktails that has garnered a James Beard Award. The Violet Hour can come to your event and provide cocktail catering (including signature drinks designed exclusively for your group), providing ready-to-serve individual bottled cocktails or a bartender to do the pouring. The Violet Hour also offers mixology demos that delve into the history of cocktails as your attendees watch and sip on their own. Or hold a private event at The Violet Hour, an elegant space illuminated by candlelight and crystal chandeliers. The entire venue can accommodate up to 150 guests for a cocktail party with passed drinks and appetizers from The Violet Hour’s seasonal menu, which includes fun options like the Fried Elvis (a peanut butter, banana and candied bacon sandwich). Surprise your guests with a food truck from Big Star, one of Chicago’s hippest restaurants. 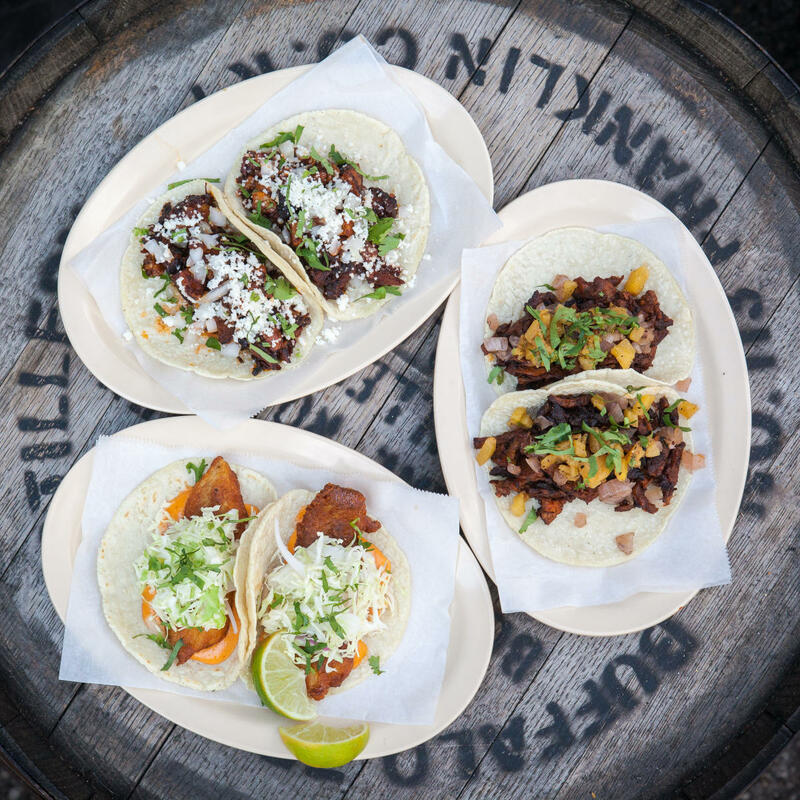 The bright yellow truck doles out Big Star’s famed tacos, including the al pastor version made with spit-roasted pork shoulder and grilled pineapple. Or set up a DIY taco bar, with tortillas, fillings and garnishes provided by Big Star to be served up buffet style. Big Star can even supply the margaritas and frosty beers like Lone Star. Or let Big Star do all the work and provide full catering services, from manning the taco bar to serving desserts and drinks. You can also go straight to the source and hold your event at Big Star in Wicker Park. Buyout the entire restaurant, which can accommodate up to 150 during cold weather months and 300 in the summer, when the popular patio is open. Big Star also offers private cooking classes for up to 12 guests in its commissary kitchen on Sunday through Thursday evenings. Sunda Chicago is a River North hot spot is known for its New Asian fare served with craft cocktails in chic environs. Kick things up a notch and arrange for your group to enjoy a Kamayan-style whole roasted pig dinner from Sunda’s in-house catering in one of its private dining rooms. 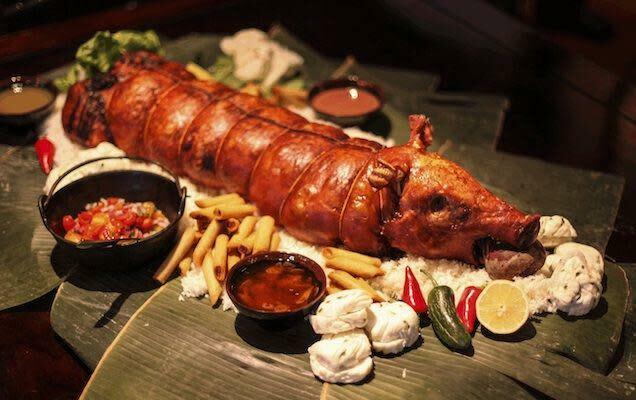 Done in the Filipino tradition, each pig (which feeds up to 20) is deboned from head to tail and stuffed with sweet pork sausage, papaya and Hawaiian sweet rolls. The meal is served family-style, with a sushi starter course and side dishes that include salad and steamed jasmine rice. Menu cards can be printed with a special welcome message for your guests. Add an interactive element to the evening, such as a maki-making class in which chefs provide instruction on the delicate art of sushi while your guests enjoy samples of Japanese sake from Sunda’s extensive collection. Or arrange a Mixology 101 class, with Sunda’s award-winning mixologist demonstrating how to make two artisan cocktails before guiding your guests in creating their own. 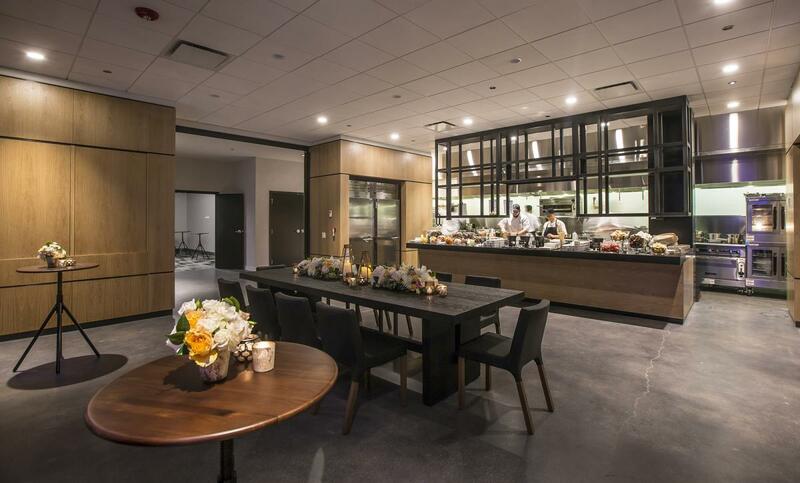 Located on the second floor of an industrial-chic West Loop building (which is the headquarters of Blue Plate Catering), Larkin Hall features a variety of spaces, including a conference center and event venue with a built-in bar. But most unique is the fully equipped tasting kitchen and three tasting rooms. It’s the perfect place for a chef demonstration or corporate team-building experience. One, two or all three of the adjacent tasting rooms can be converted into seating dining areas, specialty buffets or breakout rooms. Blue Plate’s catering staff is at the ready to customize an unforgettable menu and dining experience for your guests. In 2018 the Wine Cellar will debut at Larkin Hall, featuring a series of small dining rooms with collapsible walls that can open the space to accommodate up to 350 guests. A focal point is the 6,000-bottle wine collection housed behind a glass wall. Also opening in 2018 is the glass-enclosed, third-floor Rooftop, boasting stunning skyline views and a sprawling outdoor terrace featuring a lush green space. The family-owned Rhine Hall distillery specializes in small batch fruit brandies. Book the tasting room for a reception with appetizers for up to 45 attendees and arrange for a private cocktail class. Guests will receive a welcome cocktail to sip as they learn how to mix Rhine Hall spirits with bitters and mixers, exploring flavor pairings to create their own signature drinks. For fun, guests can engage in a friendly cocktail competition. Afterwards, take a tour and learn about the Solberg father-daughter team who founded the distillery and produce their European-style brandy using fresh fruit sourced from farms in the Great Lakes region. Thousands of pounds of apples, peaches and plums are chopped, fermented, distilled and bottled in-house (each bottle contains roughly 25 pounds of fruit!). End your tour with a tasting of Rhine Hall’s spirits, including apple brandy and grappa.